Thinking about moving to Chengdu? You’ve reached the right place. This QnA format blog post is an ultimate expanded guide based on my previous article, “expat life in Chengdu” (archived). What is living in Chengdu like? What is the realistic cost of living in Chengdu, including rent? What is the best and easiest way to find a house for rent in Chengdu for a foreigner? What is the weather in Chengdu like? How is the Pollution in Chengdu? What is the food in Chengdu like? What is the music scene like in Chengdu? How to open a bank account in Chengdu? How about the traffic in Chengdu? How about Railway Stations in Chengdu? Which VPN should I use in Chengdu? Need Relocation Assistance & Consulting? Moving to Chengdu or China, in general, can be both exciting and frustrating. I’m a Chengdu resident since 2015. I chose to live in Chengdu because of the quality of life here. Another reason is my wife, who’s a Chengdu local. A lot of people think Chengdu is just a tourist city, but that’s not the truth. Chengdu is evaluated as a city with great economic vitality, a superb business city, right tourist destination and a national model city for environmental protection. It has won the UN Habitat Award and International Thiess River Award. Furthermore, Chengdu is one of the booming cities in China when it comes to IT and development. Chengdu government is continuously working on new schemes and plans for the overall development of the town and its suburbs. Alright, let’s jump to the topic. Here are the frequently asked questions about life in Chengdu, the capital of Sichuan. Chengdu is a beautiful city to live in when you compare it to other big Chinese cities like Shanghai, Shenzhen or Beijing. Quiet overnight, Chengdu is transforming itself into a huge modern city. New subway lines pop up almost every year. Chengdu Locals are fun loving and relaxed. I usually spend my weekends in Qingchengshan Town, Dujiangyan though. You’ll find lots of places to hang out here. There’s a handful of Western restaurants in the city, and new ones are popping up left and right. Without a doubt, Chengdu is a convenient place to live as an expat. If you like to chill a bit in the evening with friends, there are a handful of pubs and bars in Chengdu. The city has garnered a reputation for its LGBT scene also. A lot of people who read my previous post added me on WeChat to clarify this part. The truth is I can’t give you an exact answer. To be honest, the cost of living in Chengdu is something often misunderstood. It entirely depends on your lifestyle. However, the majority of expatriates can earn much higher than that provided to the locals in Chengdu. I’ve heard English teachers are paid well if they choose to work at a reputed school in Chengdu. Since I am a minimalist freelancer who’s inclined to the IT niche, I do not know a lot about the “life as an English teacher” scene in Chengdu. Shared apartments range from 1000 RMB to 4000 RMB. 15 RMB to 30 RMB for one inexpensive meal. 5 RMB for domestic beer. 1 RMB or 2 RMB for buses within the city limit. Electricity and water are prepaid. You’ll be sharing this with your roommates. Together it may cost around 100 RMB maximum per month. Internet fee is around 100 RMB per month. Verdict: If you’re a bachelor, consider moving to Chengdu if your employer offers 7,000 RMB net salary, at least. Trusted and tested service. Click the image to open an account. Trust me; it won’t be easy if you don’t speak Chinese. Check out ChengduLiving.com forum (that I moderate) and GoChengdoo forum where you can address your query and find expat roommates or English-speaking landlords. 1. Be sure about what kind of apartment you need for rent. Your choice varies according to who you are. During my early days in Chengdu, I preferred not to live with students. So I had to refine my search for roommates and apartments based on that. Set your standard or ground rules before apartment-hunting. 2. Talk to other expats. Chengdu Living and GoChengdoo are the active expat forums here. There are countless WeChat groups as well. Join an expat community WeChat group before moving to Chengdu. Get insights from long-term expats. Feel free to add me on WeChat*. Undoubtedly one of the top classified sites in China. If you speak Chinese, use this website to find new apartments. If you are on a PC, visit cd.58.com right away. Only seek help from agents and third parties when best practices aren’t working. There are a lot of shady agents and landlords here. Be careful. Since ancient times, Chengdu has been known as “the Abundant Land” owing to its fertile soil, favorable climate, and the famous Dujiangyan Irrigation System. But in reality, “Sichuan’s basin” Chengdu is quite cloudy. Winter can get very dark and cold. Summer can be annoyingly humid. Pollution in winter can get hazardous for the sensitive group. According to 2016′ data, Chengdu just barely edged out Beijing for highest PM2.5. You should think twice before moving to Chengdu if you have a toddler. Take precautions like buying an air purifier, filters etc. Always check the air quality index (AQI) and wear masks whenever it’s necessary. Better safe than sorry. Chengdu food falls under the banner of Sichuan Cuisine, which is one of the Eight Regional Cuisines of China. One main thing I noticed is that a lot of places serve oily food. Be careful if you suffer from GERD or if you’re someone who quickly gets gastroenteritis. Other than that, Chengdu is famous for its cuisine. You should try hot-pot when you’re here. You can either have the extra spicy hot-pot or the non-spicy one. There are a few Auchan, Carrefour, Walmart outlets in Chengdu. Most of them sell imported items as well. So yeah, you can cook at the apartment if you’ve got time. It will save your money as well. Chengdu is home to several local and international artists, DJs and performers. Music scene won’t be majestic as in Shanghai, but yeah it’s fantastic out here. Chengdu is one of the cities that hosted STORM Electronic Music Festival 2017, China’s first and most prominent international electronic dance music festival. 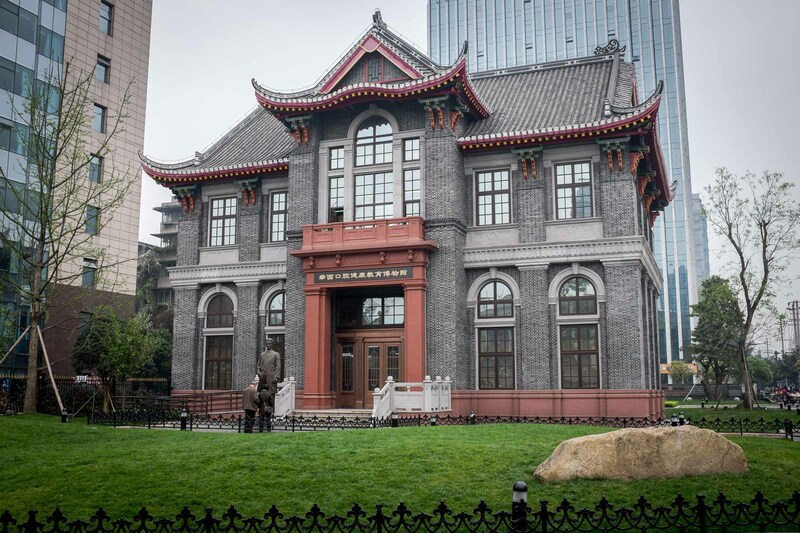 The city is home to The Sichuan Conservatory of Music (Chinese: 四川音乐学院), founded in 1939, one of the leading music institutions in China, and is considered to be the largest conservatory in the world. It is pretty straightforward if you speak Chinese. Otherwise, you might need help from a local friend or colleague. Different banks have different rules for signing up an account. Do check with your employer and open a bank account according to that. Keep in mind that the regulations have changed recently. Now you need to submit more paperwork to apply for a bank account in Chengdu. Once your application goes well, you have to make your first deposit in cash. It’s often up to 100 CNY at once. After that, you’ll need to set up a six-digit password / PIN for banking in China. After the whole process, they’ll give you a UnionPay ATM card. You need to submit passport as identification for buying SIM card in China. Make sure that your phone is already unlocked, and you will have no trouble using a new SIM. China Mobile, China Unicom, and China Telecom are the big three carriers in China. You can buy SIM card either from a retail store or by visiting any of the official stores of a carrier I listed above. The language barrier will be a problem so take your Chinese friend when you decide to buy a new sim card. It’s pretty convenient if you ride a bike. Chengdu is notorious for bad traffic during rush hours due to its centralized layout. Subway lines are expanding now and then, which is a good sign. And yes, you can quickly grab a green taxi cab from downtown. DiDi is another option. I’ve heard DiDi has an English interface now. There are three major railway stations in Chengdu. Chengdu North Railway Station, Chengdu East Train Station, and Chengdu South Train Station. The city is going to build the fourth train station – Chengdu West Train Station. Booking a train ticket is pretty easy online. However, foreigners have to show their passport to collect physical tickets after booking online. I’d suggest ExpressVPN over any other VPN providers. Their services have been stable over the years. Feel free to use my affiliate link if you’d like to support this blog. SocketPro is a secure and cheap alternative if you can’t afford ExpressVPN. Now that you’ve got a clear idea about life in Chengdu, take a look at the apps you need for living in China, install these apps before moving to Sichuan. Bring the medication/prescribed drugs you need. Check with the customs and their rules also. Purchase a VPN service: Mainland China is not for the faint-hearted. Google and everything related to Google is blocked here. Meaning, you won’t be able to use PlayStore or sync Google services without a VPN. Applicable to Facebook, Twitter, Medium and more. Install Amap aka AutoNavi: Forget Google Map. Apple Map uses its special AutoNatvi API to power their services in China. Google Map is poorly optimized for greater China (even with a VPN, it’s almost useless). Install maps.me: their offline content works here. Install WeChat: You need this multi-purpose application to survive in China. It’s more like messenger + Facebook + Twitter + Paypal. Install Alipay: another online payment platform widely used in China. Install Pleco: an English & Chinese Dictionary application for iOS and Android devices. Got some general questions about life in Chengdu? Wanna join expat groups in Chengdu? Feel free to email me webmaster [at] mighil.com or add me on WeChat (mighil). Alternatively, you can ping me on Facebook. I’m quite busy these days, so please don’t expect a swift response. I do offer relocation consulting and assistance, get in touch with me if you’re interested. Please report the broken links by sending me a message on WeChat. Chengdu Places Directory Listing. Chengdu Places is a concise but detailed listing of the best places in the Sichuan capital city. Chengdu Living Blog & Forum. Useful Chengdu focused blog with a dedicated forum and podcasts section. I moderate the website. GoChengdoo. Another useful forum and blog. Chengdu Expats Facebook Group. I moderate the group. Chengdu Gaming Federation. Group of hobbyists and game industry professionals living and working here in Chengdu. /r/Chengdu/. A subreddit for residents of the Sichuan capital. I’ve analyzed answers from a Chengdu related thread on Quora. HQ photos from justcharlie.com. Charlie is a good friend of mine. He’s an American designer and DJ who’s been living in China for ten years. I can help you sort out all your inquiries and doubts regarding life in Chengdu. First come, first served. *I will respond to generic email inquiries but I do not offer a free one-on-one consulting via WeChat or Skype. I charge flat 30USD per hour for relocation consulting and assistance.